The Saints played for their proverbial lives tonight. Offensively, they played very well, but defensively they were spectacular. When no one but themselves and their fans gave them a snowball’s chance in hades of winning this game, they marched into the Georgia Dome and took care of business. The game started off rather uneventfully for Drew Brees and company as they went three-and-out. 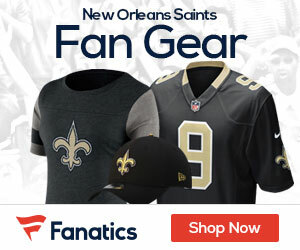 But the defense kept the Falcons in check as well and so it went until the Saints put together an impressive drive that ended with a 52-yard Garrett Hartley field goal. Next Falcons possession, the Saints caught a huge break when the Falcon’s center, Todd McClure mishandled the snap to Ryan and a blitzing Jonathan Vilma alertly fell on it. The Saints were very impressive after the turnover, particularly Pierre Thomas who rumbled through for a critical 16-yard run before walking 2 yards into the endzone for the game’s first TD giving his team a 10-0 lead. The lead was short-lived, however, as the Falcons responed quickly with a 78-yard touchdown drive of their own. With 7:28 left in the first quarter, Matt Ryan hit Roddy White for a 7-yard touchdown pass to narrow the score to 10-7. The Saints made one more impressive drive after that, but were knocked out of scoring range by a couple of big defensive plays by the Falcons. The score was 10-7 at halftime. In the second half, the Saints defense flexed its muscle in front of the national television audience and showed everyone that they are capable of playing some tough football too. On a penalty-ridden drive in which the Saints literally escorted the Falcons down the field, the goal line defense of New Orleans came up huge. Jeff Charleston hit Michael Turner on the goal line, forcing a fumble that was alertly recovered by Marvin Mitchell. The Saints failed to take advantage of the turnover that time though, even though they put together a few good series to move the ball down the field. Instead they ended up punting after using three minutes and some change off the clock. The Saints defense kept Atlanta off their game to start the second half. The Falcons offense couldn’t seem to get anything going. It was a horribly ill-advised throw by Drew Brees that led to the Falcons only other touchdown when Chauncey Davis intercepted a little flip pass intended for Reggie Bush. Atlanta took its first lead 14-10. Brees subsequently threw his second interception of the night to John Abraham on the Saints very next possession. Worthy of noting though is the fact that Brees was the one who tackled Abraham and prevented him from running it all the way back. It was a great job by the Saints defense to keep Atlanta from capitalizing off the turnover. The Saints offense drove the field almost effortlessly, capping the drive with a 25-yard touchdown reception from Brees to Colston. But once again, a penalty wiped it out when Jermon Bushrod was flagged for a false start. Talk about a momentum killer! The drive eventually stalled. Fortunately, the Saints defense came to play and was able to keep Atlanta from scoring. The Saints final scoring drive was nothing short of brilliant. This time, Payton used a balanced offensive scheme that kept the Falcons defense off balance. For the first time all night, New Orleans weathered the blitzes leaving the Falcons looking confused. Brees hit Lance Moore for an 18-yard pickup to move the chains on 3rd and 11. Then Payton called a reverse run by Devery Henderson for 11 yards and another first down. Then the crafty skill and footwork of Pierre Thomas turned a short pass into a critical 22-yard gain! 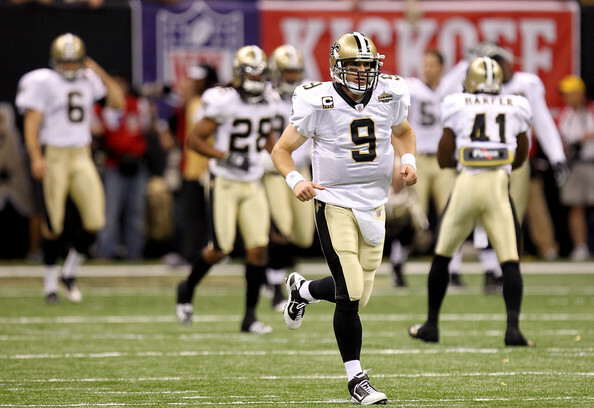 With 3:24 left in the game, Brees threw a strike to Jimmy Graham for a 6-yard touchdown. After marching 90 yards and chewing up more than 7 minutes off the clock, the Saints regained the lead and never looked back. The defense was able to hold the Falcons, forcing them to punt on 4th and 6 with 2:52 left in the game. The Saints subsequently picked up some key first downs and were able to just run the clock out. This, the final Monday Night Football game of the 2010 season, certainly lived up to all the hype. With this victory, the Saints clinch a playoff berth for the second time in two years. There were so many impressive performances on offense, but I was so very proud of the defense. After being ridicluled last week because of the lack of defense against Baltimore, Gregg Williams had his guys ready to play and they rebounded nicely. Hopefully, they’re just getting warmed up for the playoffs. Drew Brees was 35/49 for 302 yards, 1 TD, and 2 Ints. Robert Meachem had 10 receptions for yards. Jimmy Graham had 4 receptions for 26 yards and 1 TD. Pierre Thomas had 63 rushing yards and 1 TD. He was phenomenal. I for one am glad he’s back. Jonathan Vilma had a critical fumble recovery that eventually led to the Saints first touchdown. Garrett Hartley nailed a 52-yard field goal, the longest of his young career. Jeff Charleston caused a critical fumble by Michael Turner on the goal line. Marvin Mitchell had a key fumble recovery after some tough goal line defense. The Saints defense held Matt Ryan to just 15/29 for 148 yards and 1 TD; Michael Turner was held to 48 yards on 17 carries; Roddy White had 3 receptions for 43 yards; and Tony Gonzales was held in check with just 2 catches. Will Smith had a key sack of Ryan, picking up his 4.5th sack on the season. He was a one-man wrecking ball in the Falcon backfield all night. On the Saints go-ahead drive to seal the win, Brees and company were 7 of 8 for 72 yards. This is the same ease with which they’ve moved the ball at critical times. With the run game in use tonight, the Saints offense looked so much better. It also helped things when Meachem came back for the ball when Brees got into trouble. That was great to see from the Saints receiver. I still say Lance Moore has the surest hands of all the Saints receivers. They are a pretty good squad as a whole though. JoLonn Dunbar had a solid game defensively as well. The Saints offensive line did not look very good tonight. Brees was hassled and sacked far too much in this one and for a while, there were no running lanes. I hope Payton gets in somebody’s face and chews them out so this deficiency can be fixed ASAP. The Saints racked up nearly 100 yards in penalties again. This is unacceptable. The Saints improved to 11-4 with the win against the Falcons. The Saints finish out the regular season next Sunday against Tampa Bay in the Superdome. What a wealth of GREAT INFO!! Thanks for another well written piece! Overall, another nail biter, but boy does our wonderful QB know how to DELIVER under pressure..talk about a game on the line…IN BREESUS I TRUST! I am looking forward to an ATL loss and a Win for us…that would be the icing on the cake! WHO DAT! Thanks, Risha! That was a great game, wasn’t it? Keep the comments coming.